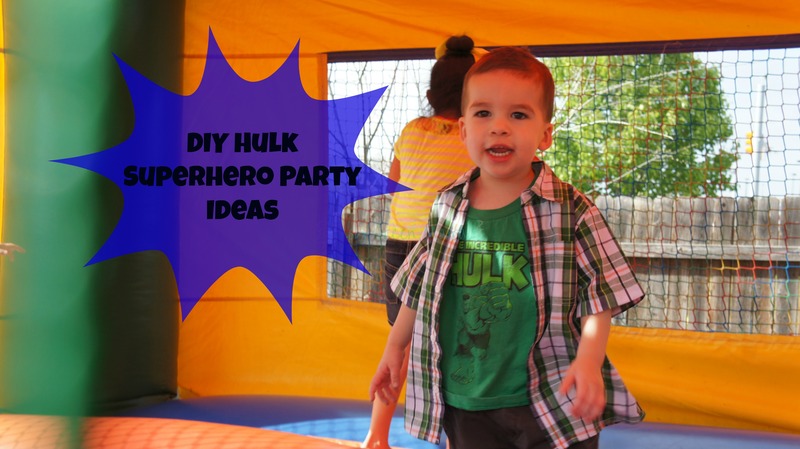 We had a DIY Hulk Party for my little man this year. I bought him this awesome hulk shirt from Amazon in a 3 pack fruit of the loom Marvel Heros pack. It came with a Spiderman shirt and a Wolverine shirt. The shirt has more of an under shirt feel so I layered it under a plaid shirt. He looked so cute! I used toys and books we already owned for decorations. I made this banner from construction paper cut into triangles, hole punched, and put on balloon string. My 6 year old and I decorated them with markers. My boy drew some awesome Hulks! I also love the Hulk fist he added to the #3…he came up with that all on his own! I made cupcakes with added green food color to the cake mix and the frosting. I also made cupcake toppers tapped to toothpicks. 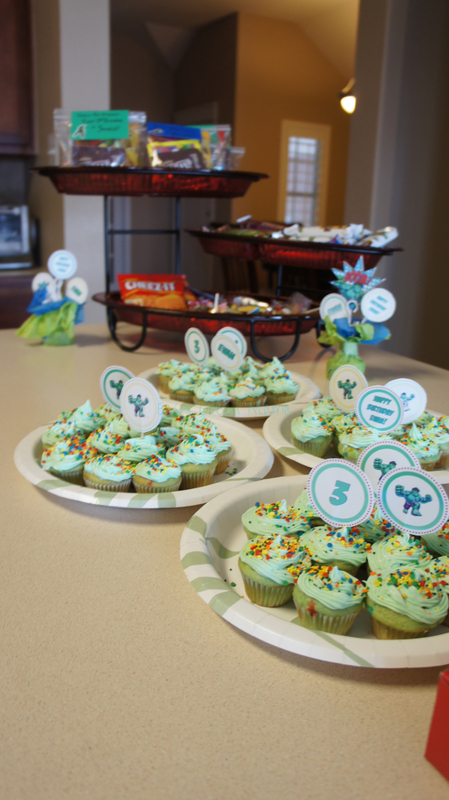 I used the toppers in the centerpiece decorations too. 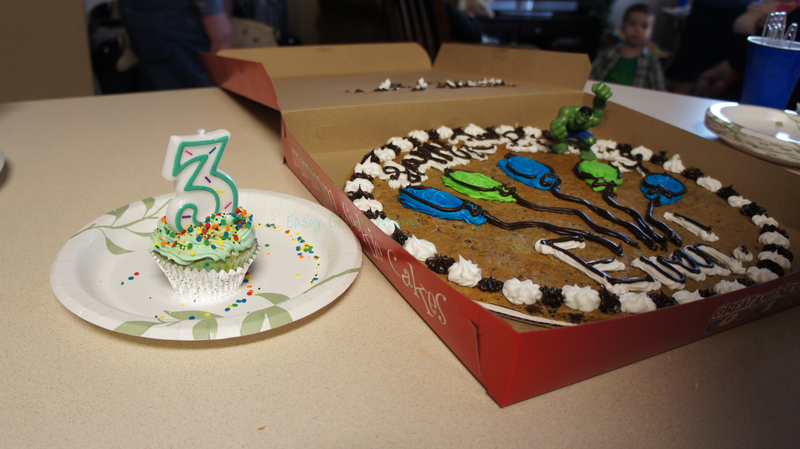 If you have read my other party post, then you know I love me some cookie cake. I have one at pretty much every party I plan! I put my son’s hulk toy on as a decoration. The cake icing got a little messed up during transportation, but it looked like the Hulk had been smashing it already. Totally made it work! For the party favor bags I used colored cardstock paper. 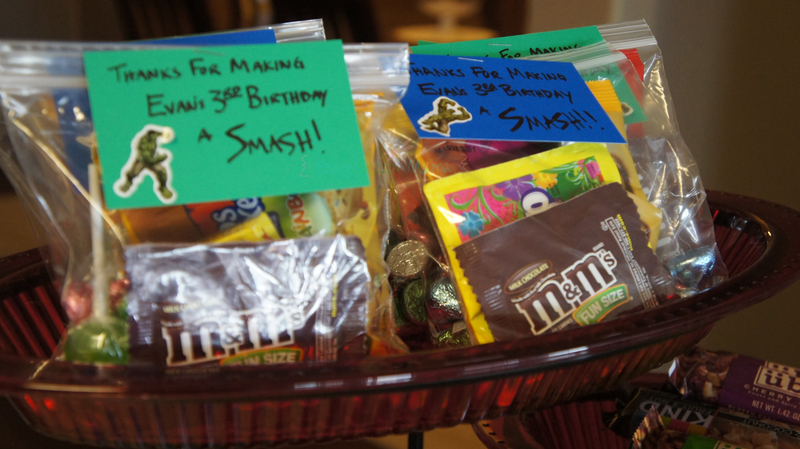 I hand wrote, “Thanks for Making Evan’s 3rd Birthday a Smash” and added Hulk stickers to each one. I stapled them to filled plastic lunch baggies. Super simple and super cheap! 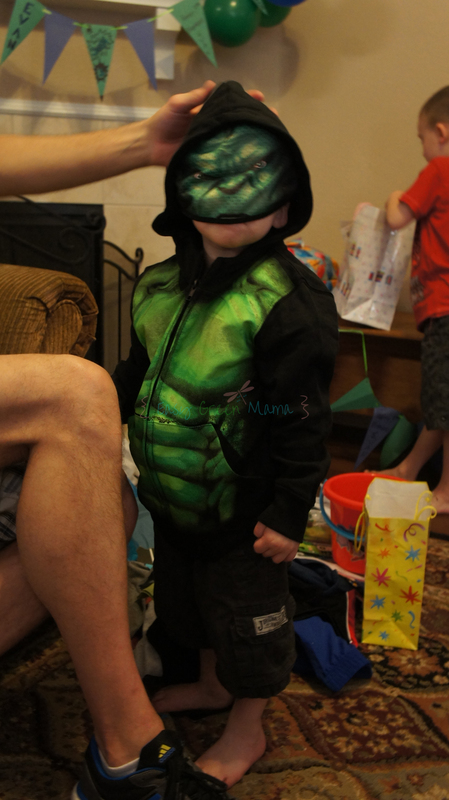 My son’s favorite gift was the Hulk hooded jacket. It was so freakin’ cool with it’s mesh mask built in! Great printables! I like your cupcakes and the drawings on the banner. It gives it a personal touch. Thanks for sharing! What a great party! Your ideas carried the theme throughout the party. Your son sure is lucky!! Oh, I love that your son helped on the banner! So much more personal than a store-bought generic, and it’ll be a wonderful memory of the day when he’s all grown up! And pinned those printables – thanks!